We are one of the premier rigging shops in the U.S.A. when it comes to high-performance swaged lines. We sell a ton of swaged cable each year, so it's nothing new to us. We know where to get it, and where not to get it--and that's key! You don't want to go to the open market and buy swaged line from the lowest bidder, and we don't. A lot of our competition does, however. Suffice it to say, we know what we're doing when it comes to swaged wire rope. We carry this line specifically for our large, commercial zip line customers. Those that build zip line parks with runs over 1,000 ft know that not just any cable will do. This cable is made to the same standards as our logging cable, and in fact, would hold up well in a logging environment. But most logging cable is greasy, whereas this line is galvanized. Zip liners don't want greasy cable and we get that. That's why this premium line gives you all the benefits of heavy-duty logging cable, with the benefit of being clean and easy to handle. If you've ever seen cable logging, then you know the line takes serious abuse. Swaged line excels in these environments because it doesn't abrade easily and has tremendous strength. 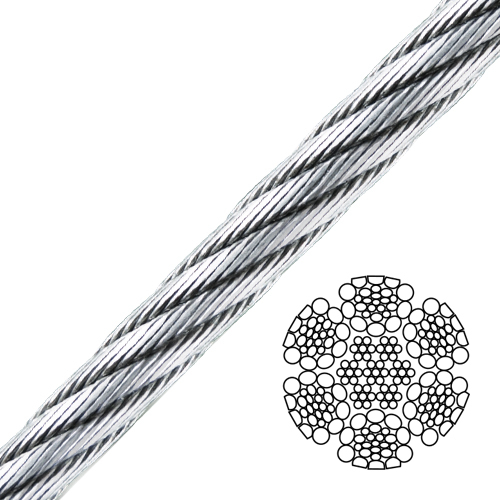 For example, regular 5/8" wire rope has a published Breaking Strength of 41,200 lbs. This premium swaged line has a published Breaking Strength of 54,000 lbs, and the factory test certificates show an actual break of 56,160 lbs! That's over 25% stronger than regular cable! To have a smooth cable that is galvanized, tough and strong is the perfect blend of attributes for zip lining. We bring this cable in on 5,000 ft reels, but longer pieces are available upon request. And now we stock all three sizes, including 3/8", 1/2" and 5/8"! If you're in need of a long run for a zip line park that is new and in the building phase, or is simply overhauling and looking to get the best line available, then give us a call. We know you'll be happy with our product and prices!